Leuce Epos are comparatively well-trained, spear and javelin-armed Gallic light cavalry. Leuce Epos (Luk Eep-os; "Light Horse") constitute the bulk of Gallic cavalry. Comparatively well-trained to many of their enemies' cavalry, they are invaluable to a Gallic army. They throw javelins at a distance, depleting an enemy before charging with their main spears. They are trained to throw javelins, charge, and withdraw repeatedly, and they do it well. They are so named for their speed, rather than equipment. A bronze helmet, shield, and their weapons may not seem the equipment of any partiuclarly great cavalry, but they are a solid medium cavalry force, capable of running down routers, defeating light cavalry, and skirmishing if necessary. Historically, Gauls were rather fond of cavalry in their later years. While Celts were originally more based upon infantry and chariots, and still were built around varying degrees of infantry, the value of extremely mobile cavalry was constantly more apparent. With that in mind, they developed good quality cavalry that could be used as both shock cavalry and ambushers. 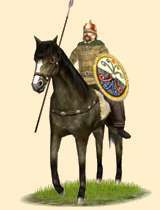 These cavalry were a large basis of what the Romans employed as their Gallic cavalry auxilia, though a bit heavier than the Gallic originals.